Anyone who has grown nauseous with the toxicity and cloying, suffocating stench of industrially civilized culture, regardless of how cynical they have become, cannot totally steel themselves against the breath of fresh air that students who organized the March For Our Lives wafts across our culture in this moment in time. Fifty years ago this summer, my generation nearly succeeded in pulling off a revolution. The millennials who marched yesterday may not pull off a revolution, but they are modeling for us how to live in the face of our predicament. Will these students save us from catastrophic climate change and extinction of species, including our own? Of course not. And while some may whine that they should be focused on climate chaos, I would argue that when someone in full-blown PTSD has returned from a war and is protesting the conflict, it is foolish to school them in choosing a more urgent and relevant cause. Will some or all of these students become distracted and co-opted as my generation was? Absolutely. Does that make their efforts in 2018 meaningless? Absolutely not. Because they are still our role models for living in these times. Yesterday, seventeen year-old Emma Gonzalez stepped to the microphone and made our culture stand still for just a few moments. As she tearfully and courageously allowed her own trauma and the carnage wrought by a shooting at her high school to pour out of her, she did something almost never seen on live television: She stopped talking and stood in silence. The silence was almost unbearable for the crowd. I was perplexed by it and kept thinking, “Emma, what are you doing?” And then, the timer she had set to six minutes and twenty seconds began beeping. That, she told us, was the time it took for the shooter at Marjory Stoneman Douglas High School in Parkland, Florida to execute seventeen people on February 14, 2018, irrevocably altering the lives of an entire community. What happened in Emma’s silence? Much discomfort. Much curiosity. And so much that directly collides with the cacophony of noise and mental twaddle with which this culture is obsessed. As long as the chatter rules, we stay on the surface of consciousness—fully ensconsed in the ego, disconnected from the heart, and incapable of descending even slightly into the deeper layers of the human soul that every single catastrophe on Earth screams at us to engage with. And therein lies my greatest fear for this extraordinary mobilization of youth. Yesterday, Cameron Kasky, another Parkland shooting survivor, told an interviewer that he really hasn’t felt the full impact of his grief. He has focused all of his energy on activism and creating a movement, yet at night, at the end of the day when the homework and the organizing are over, and he puts down his phone, the trauma and pain and the heart-wrenching grief begin to overwhelm him. Teenagers and twenty-somethings are not as amenable to exploring their grief as they may be in two more decades. The teens and twenties are extroverted years of action and forming social relationships, not as conducive to inner work as the forties and fifties. But when I notice this, I also notice that in traditional and indigenous cultures, this was not so. In reality, what Emma and her friends are experiencing is a profane, contemporary iteration of what youth in ancient, tribal times experienced in a sacred, contained, ritual setting. In those times, the community understood that rites of passage in youth were as necessary as learning to walk, cutting teeth, or entering puberty. Thus the community prepared its children for adolescent rites of passage because they understood that children come to this life with an inherent need for them. In fact, they understood that not providing rites of passage or what is sometimes called initiation, guarantees that the child will never grow up and in fact, will become toxic to the community. In ancient communities, the young person discovered through initiation, firsthand what she or he was made of, just as the students who have experienced and are experiencing the trauma of a school shooting are discovering their deeper identity—one they did not know they had and one that they assumed would only come later as a result of life happening to them. Rites of passage are not only uncomfortable; they are brutal. I have written for many years that the human species is now experiencing a planetary rite of passage in the form of the mass extinction that we have brought on ourselves and all other living beings on Earth. It is a collective spiritual initiation that we are not likely to survive, but initiation has never been about survival. It has always been about awakening to the deepest inner wisdom that we came here with. It has always been about making meaning in the throes of our ordeals. It’s about awakening to the extraordinary beauty and mystery and joy that awaits us as we deeply connect with other living beings and as we open to Earth intimacy and the ultimate awareness that we are not some vague, “part” of the Earth, but that we are Earth. 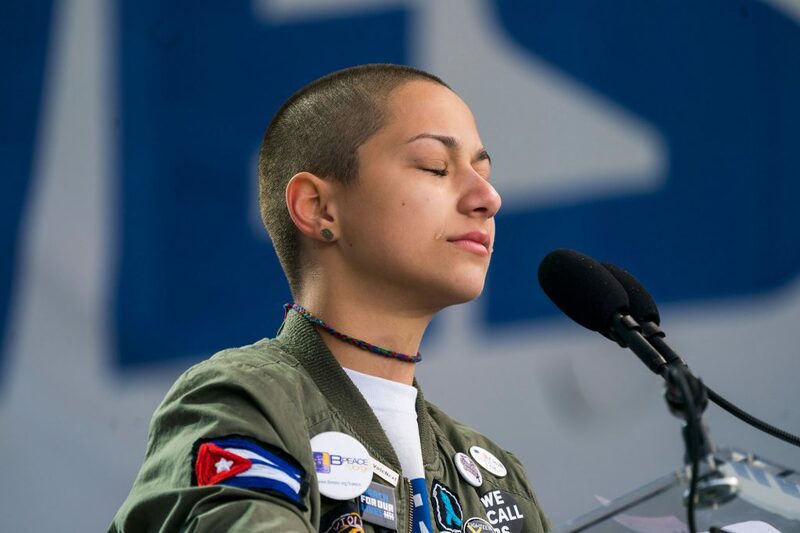 One more time, watch Emma giving her March For Our Lives speech. Watch the pure, unadulterated grief that her body exudes. Watch the courage, the determination to hold the silence despite the discomfort with it in everyone around her. Everything she has said or done publicly since February 14, 2018 is an expression of her rite of passage. And for those of us who are “woke” as these young people are calling it, for those of us who understand that our planet is dying, and that we have helped annihilate it, we too are experiencing a planetary initiation. The next generation of youth who marched yesterday are revealing to us firsthand who we need to be and what we need to do. We need not agree with them that the world can be changed, but we can embrace the initiation and keep struggling with the ordeal, and most importantly, we can commit to living with the questions, no matter what: Who do I want to be and what am I being called to do? Paradoxically, the horrors of the Parkland shooting have brought new life to its survivors—a capacity to see the world with new eyes, a freedom as many of them have stated, from the tyranny of popularity and prom dresses and possessions. I have no doubt they would deeply resonate with the following poem by John O’Donohue as the final blessing flowing from their initiation. Let us all cherish the silence that lovingly calls us to go deeper and feel our grief, our rage, our love, and our joy. Then, let’s connect and organize and do the work we came here to do. Our initiation has been and will become increasingly painful. And in it is a liberation and a joy we will find nowhere else.